Danny Davies Gans (October 25, 1956 – May 1, 2009) was an American singer, comedian and vocal impressionist. Gans was a performer on the Las Vegas Strip and the surrounding area, where he was billed as "The Man of Many Voices." He had been named Las Vegas Entertainer of the Year and his production had also been awarded Show of the Year for 10 straight years from 1998 to 2008. Prior to entering show business, Gans was a professional baseball player. He was drafted by the Chicago White Sox after being named an All-American at California Polytechnic State University in San Luis Obispo where he was a Physical Education major. It was at Cal Poly that he met his wife, Julie. Later, he held a small role as a third baseman in the film Bull Durham. After an injury ended his sporting career—a player's cleats tore his Achilles tendon while he was fielding a ground ball—Gans turned to the entertainment industry. Gans began his career on the road, performing mostly at private corporate functions. In 1992, he played Dean Martin in the CBS miniseries Sinatra. In 1995, he moved to Broadway to perform a one-man show, but later decided to move to Las Vegas to reduce time away from his family, who lived in Los Angeles. Gans started his Las Vegas stay at the Stratosphere Hotel in 1996. His show there was successful, and he moved over to The Rio in 1998. In 2000, Gans's show moved again, this time to The Mirage, where the Danny Gans Theatre was built for him. In February 2009, Gans changed venues again and performed at Encore, the sister property to Wynn Las Vegas. The marquee on Las Vegas Strip bearing his image, at one time, held the record as the largest freestanding marquee in the world. His first record album, produced by Michael Omartian, was cross-marketed in both the pop and Christian music genres and, although Gans never charted, it sold in both mainstream and Christian music outlets. At the time of his death he was grossing $18 million a year. He was also known for his vintage car collection. Gans died on May 1, 2009, at his home in Henderson, Nevada, shortly after his wife called paramedics saying he was having difficulty breathing. The cause of death was a drug toxicity caused by the combination of hydromorphone (an opiate, commonly marketed under the name Dilaudid) and a pre-existing heart condition. It was determined that his death was caused by an adverse drug reaction, and was not drug abuse-related. Gans had three children, Amy, Andrew and Emily. He is interred at Forest Lawn Memorial Park in Glendale, California. Gans had been noted many times for his role in Bull Durham, although his part in the movie was ultimately downsized. He used this role as an addition to his resume, even going on Roy Firestone's show and promoting the role while holding a picture of himself from the movie to prove that he was, in fact, in it. Gans played Roger in the TV series Silk Stalkings for 12 episodes (1991–92), played Scott Babylon in the series Duet (1987–89), and reprised his role in the series Open House (1989–90). In the 1991 Roseanne episode "Vegas, Vegas", he played a Wayne Newton impersonator. He had an uncredited cameo as himself in the 2009 film Race To Witch Mountain. Gans was mentioned several times, but did not appear, in an episode of the TV series Gary Unmarried (which aired shortly after his death, on May 6, 2009). When aired, the episode was accompanied by an "In Memory Of" end-credit dedicated to Gans. ^ Grimes, William (May 2, 2009). 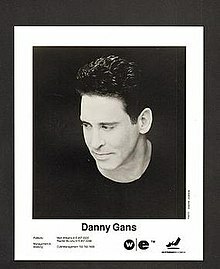 "Danny Gans, Impressionist, Dies at 52". The New York Times. Retrieved May 2, 2009. ^ "Danny Gans On His Own Mortality And Legacy". Retrieved 2009-05-07. ^ Roark, Scott (Fall 2008). "Danny Gans Has Faith, Fame". Cal Poly Magazine. Archived from the original on 2011-09-28. Retrieved 2009-05-03. ^ "Biography". Archived from the original on May 16, 2008. Retrieved 2009-05-07. In May 2008 Danny Gans celebrated 12 years in Las Vegas, the last eight of which have been spent...at the Mirage. ^ a b c Barry, Dan (May 20, 2009). "Vegas's Man of Many Voices Falls Silent". The New York Times. Retrieved 2009-05-21. ^ Allen, Marshall (2009-06-11). "Danny Gans report raises questions from pain specialists". Las Vegas Sun. Retrieved 2009-11-11. ^ Powers, Ashley (2009-06-09). "Drug toxicity cited in death of Las Vegas' Danny Gans". Chicago Tribune. Archived from the original on 2009-06-12. Retrieved 2009-06-09. ^ "Coroner: Danny Gans Died From Drug Reaction". Huffingtonpost.com. 2009-06-09. Retrieved 2011-08-03. ^ REVIEW-JOURNAL, NORM CLARK LAS VEGAS. "Wynn, Clooney exchange barbs, again, Gans Moved to Forest Lawn". Las Vegas Review-Journal. Retrieved 2016-03-09. ^ "Danny Gans (1956 - 2009) - Find A Grave Memorial". www.findagrave.com. Retrieved 2016-03-09.